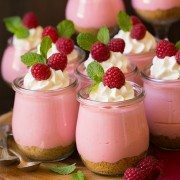 No Bake Cheesecake Mousse – the ultimate easy dessert! 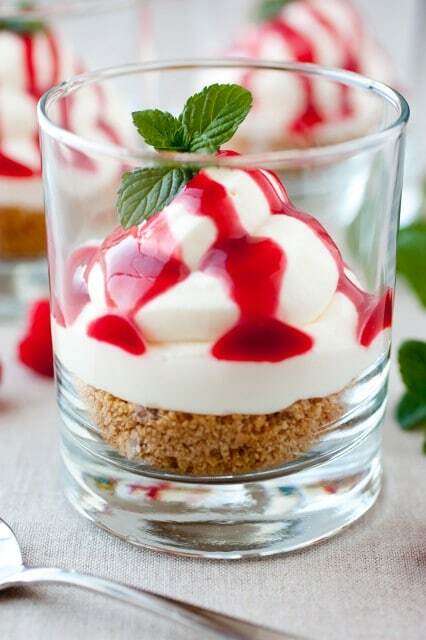 Layered with buttery crumbled graham crackers, a rich fluffy cheesecake mousse, and finished with a bright raspberry sauce. With Christmas just around the corner I’ve decided an elegant yet simple dessert was in order. I’ve been wanting to make a no bake cheesecake for a while and I figured this was the perfect time seeing as Christmas is just a few short days away! It gave me the perfect opportunity to create a festive dessert with it’s vibrant red and green color combination. 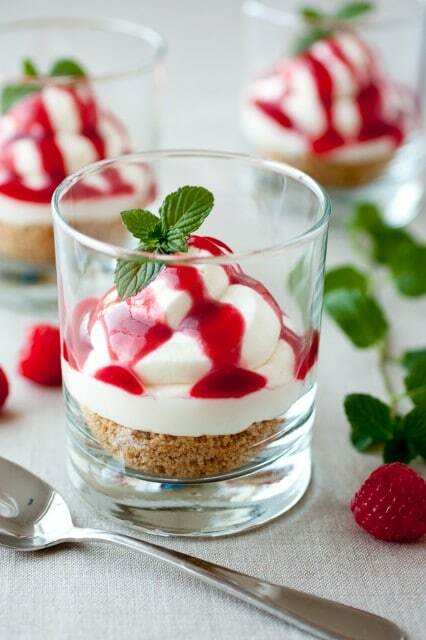 There are many no bake cheesecake recipes out there which look fantastic. Some of them call for one ingredient in particular that I’m not so fond of, frozen whipped topping (aka Cool Whip). I just really don’t like the stuff. Yes, I will eat it but I would so much rather have the real thing. I don’t even know what half the ingredients it contains are, which may explain its strange after taste. So, I decided to create my own no bake cheesecake recipe using real cream instead. I also decided the texture of this is more like a Mousse than a cheesecake, hence the name I chose. Just as Good as Baked Cheesecake! 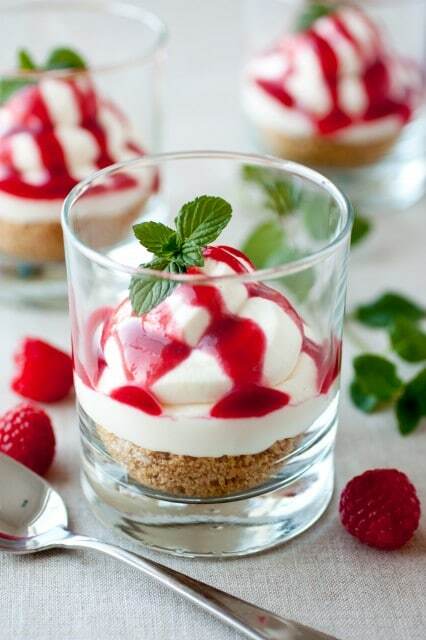 Honestly it is now hard for me to decide which I like better, the baked cheesecake with far more effort and longer chilling times or this No Bake Cheesecake Mousse. I love it’s delicately smooth, fluffy and even creamy texture. It is so much lighter and fluffier than your average dense and heavy cheesecake. This has just the right amount of richness and the perfect balance of sweet to go along with the slight tartness of the raspberries. This is one simply divine dessert you you won’t easily forget. I may just dream daily about this stuff =). What’s the Corn Syrup for? 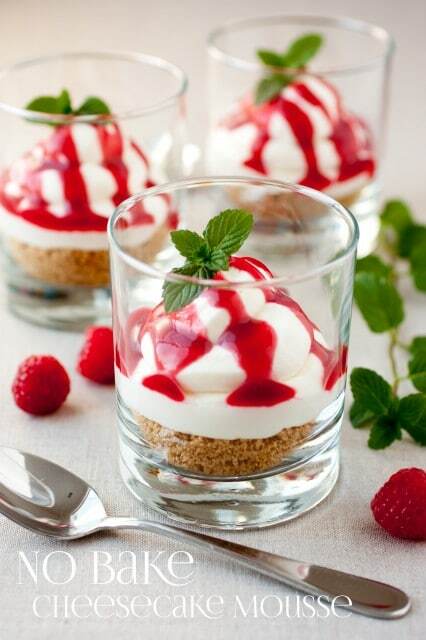 Once you see the ingredients in the Cheesecake Mousse you will probably ask, why the corn syrup? To answer that, my Grandma taught me that just a bit of corn syrup works as a good stabilizer for whipped cream. So, I added it in to help stabilize the mixture so it doesn’t loose all that air and fluff that was whipped into it. Note that you may likely have just a bit of extra raspberry sauce left over (I adapted the raspberry sauce recipe from my White Chocolate Cheesecake with Raspberry Sauce). I myself had just a bit left over but I’m sure I will find a good use for it, such as blending it into a smoothie, drizzling it over my morning oatmeal, or maybe just drinking it =). Merry Christmas everyone! Enjoy! 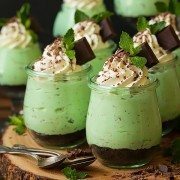 The ultimate easy dessert! 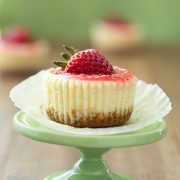 Layered with buttery crumbled graham crackers, a rich fluffy cheesecake mousse, and finished with a bright raspberry sauce. In a small saucepan, whisk together granulated sugar and cornstarch until well blended. Stir in cold water, lime juice and raspberries. Cook over medium heat whisking frequently, until mixture reaches a boil. Allow mixture to gently boil about 5 minutes whisking constantly and reducing temperature slightly if necessary to reduce splattering, until sauce has thickened. Remove from heat and force sauce through a fine mesh strainer into a bowl or airtight container. Cover and refrigerate. In a mixing bowl, using an electric hand mixer set on high speed, whip heavy cream until soft peaks form. Add in corn syrup and whip until stiff peaks form, set aside.In a separate mixing bowl, using electric hand mixer set on medium-high speed, whip cream cheese until very smooth and fluffy, about 3 minutes. Mix in powdered sugar and vanilla. Fold half of the whipped cream mixture into the cream cheese mixture and fold until combine, then fold in remaining half of whipped cream. Cover bowl with plastic wrap and refrigerate for 2 hours (or up to 8 hours if needed). In a small mixing bowl, whisk together crushed graham crackers, light-brown sugar and cinnamon. Using a fork or clean fingertips, blend in melted butter until mixture is evenly moistened. Cover bowl and refrigerate until ready to assemble. Note: assemble just before serving for best results. Remove above prepared mixtures from refrigerator. Divide graham cracker mixture among 4 small glasses or dessert cups, pouring about 1/4 cup in each, lightly press into an even layer. Spoon cheesecake mousse into a large Ziploc bag, seal bag and cut a 1-inch edge off one corner of the bag then pipe mousse over graham cracker crusts. Pour raspberry sauce into a small Ziploc bag, seal bag and cut a small tip off one corner, then pipe raspberry sauce over tops. Garnish with mint leaves if desired.